“Young at Heart” is a ballad that most of us have heard at least a few times; it’s ubiquitous enough to appear in movies pretty often. It happens to have been one of my grandmother’s favorite songs, and the tune she always put me to sleep with when I stayed with her. I don’t know whether she picked this song as my lullaby because she loved Frank Sinatra, or because she thought I’d like it, or simply because it was on her mind one night when she was tucking me in and then it became our ritual. Regardless, I’ll always think of it as her song, not simply because she sang it to me so many times, but also because it’s a perfect embodiment of who she was: a woman who took continuing education classes and soaked up lectures until she no longer could; a person with boundless intellectual curiosity and energy; someone who exuded what I think people mean when they talk about joie de vivre. “Young at Heart” started playing in a store when I was out and about running errands yesterday. It had been a long time since I’d heard it, and I was surprised to find tears streaming down my cheeks nearly as soon as I recognized the tune. It’s becoming more tender for me as the years since my grandmother’s death go by. It’s one of the most vivid connections I have to her: no matter how famous and celebrated the song’s original crooner, I can’t hear it without immediately and vividly remember it being sung in my Yaya’s voice. My grandmother taught me a lot about courage and vitality and generosity of spirit; I’ve always known this. She also gave me lessons in how to remain young at heart, though I’m only just beginning to recognize them. It was impossible for me to feel the poignancy of her invitation to “laugh when your dreams fall apart at the seams” when I was a little girl, or to fully understand the “narrowness of mind” that the song presents as being at odds with youngness of heart. Last night, I found myself saying out loud that I feel much younger than I expected to feel after this past birthday. It’s true enough that I said it without thinking about it, but later on it occurred to me that I didn’t feel this way a few years ago. Instead, I was weary and downhearted. Even a few months ago, this past spring, I felt bone-tired, though it’s hard to say how much of that was just burnout at work. At the start of this summer, my friends and family—knowing that I’ll be entering my DI year in just six weeks—asked if I had big and exciting summer plans. My answer was no, not really. I didn’t want to travel or to pack my schedule with socializing, no matter how many lovely things there are to do in New York at this time of year. I simply wanted to savor my time a little more than I had been. I wanted to relish longer days, sun on my face, the sleepy rhythms of the city when it’s empty on holiday long weekends. I wanted to take pleasure in the everyday, knowing that my routine is going to change a lot in September. I think I’ve done this. Not always, not all the time—I could always be more conscious. But I really have been relishing the moments. I’ve been feeling so very smitten with my home town, and even with my neighborhood and my block. I’ve gotten outside a little more. I’m not cooking much, but I’m putting together three simple meals each day and taking great pleasure in all of them. Life feels sweet, and this sweetness gives me a window into preserving a youthful heart. I don’t know what my Yaya’s trick to remaining youthful was; I suspect it was in her nature to be that way, but I’m sure it was a choice, too, which she reinforced with the way she lived. I wish she were still around, so that I could ask her about it. What I know today is that I feel more wondrous and amused by life than I have in a while, and that recognizing the small pleasures strewn through ordinary days has had everything to do with it. I think my Yaya would agree. Wishing you a week that begins with a little lightness of spirit. 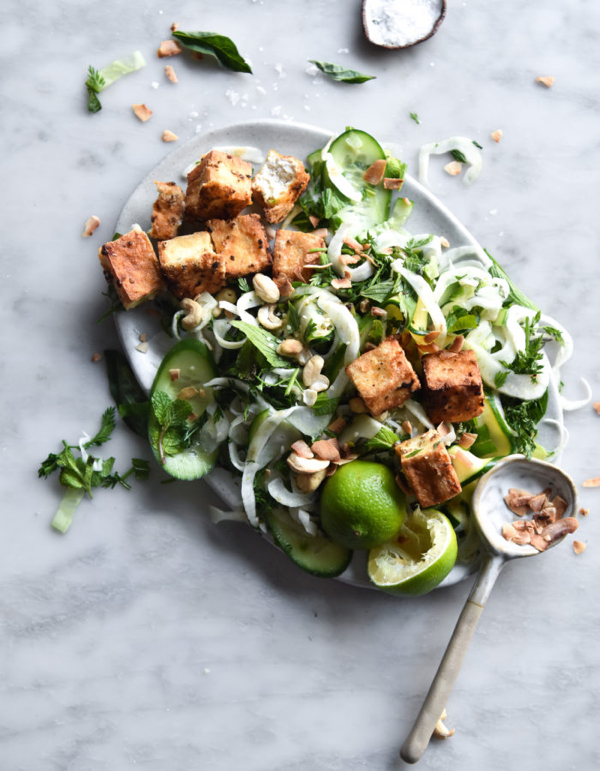 Here are the recipes and reads that I’ve been enjoying in the last few days. 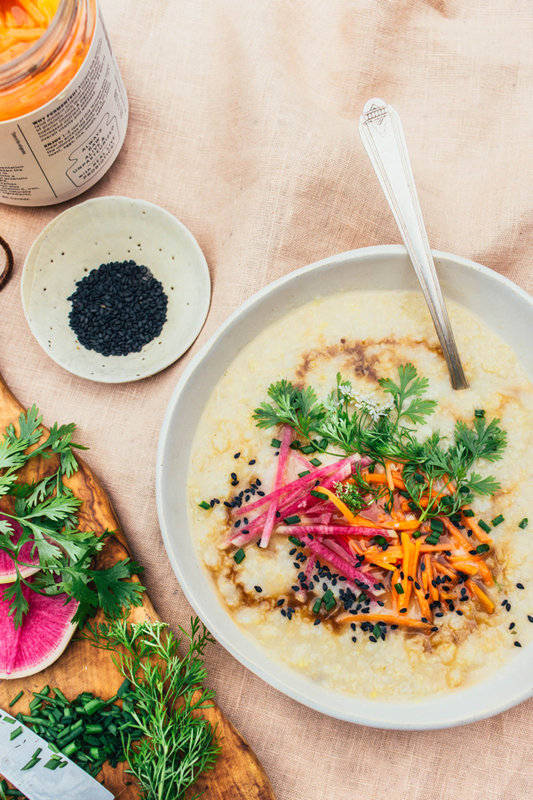 The congee that made it into Power Plates has become one of my favorite make-ahead breakfasts. I’m loving Sophie’s quinoa version, with its “miso flavor bomb” and fermented veggies. 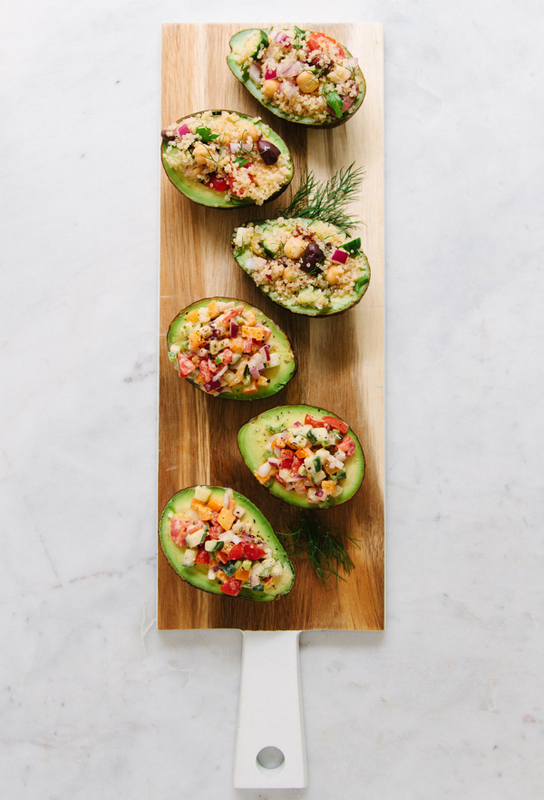 What a simple, pretty dish for summer get-togethers: Julie’s colorful stuffed avocado halves. I don’t think I’ve made a successful salt & pepper tofu—or pepper tofu, for that matter. I’m feeling inspired by Georgia’s crispy version. 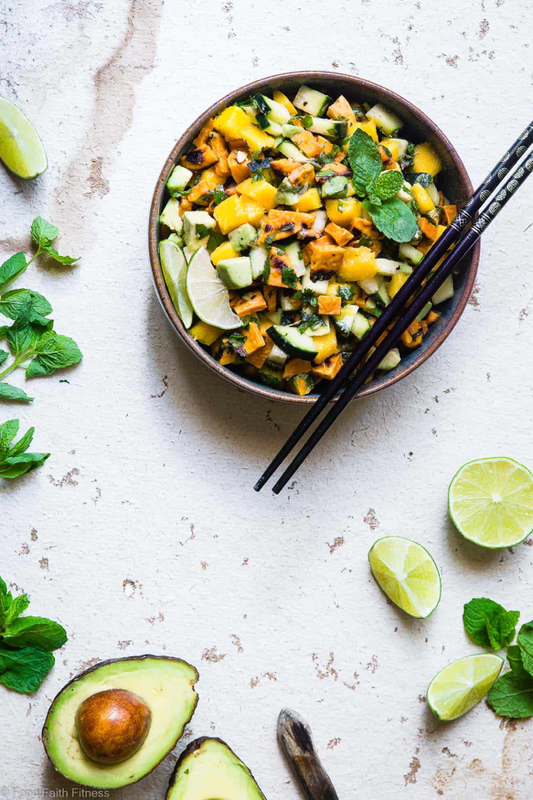 Taylor’s Thai mango salad with grilled sweet potatoes is stunning, and so summery. I’m already on the lookout for homemade snacks that will fill me up for next year. 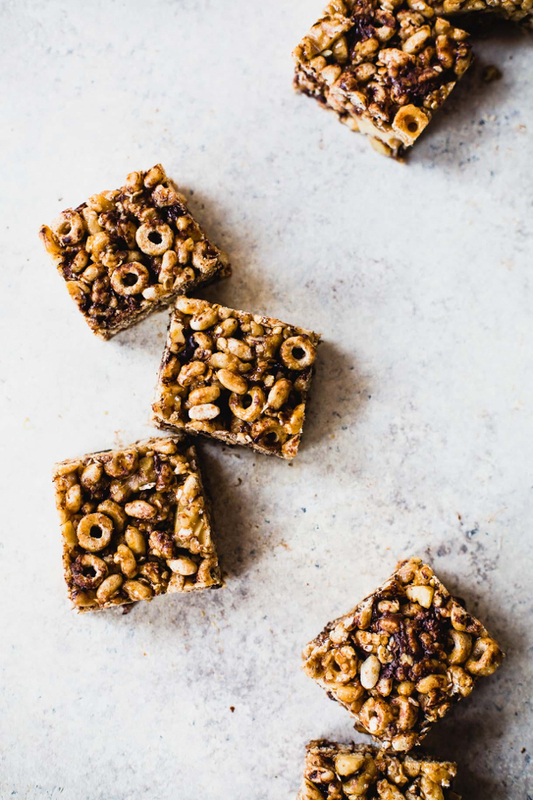 Bookmarking Amanda’s delightful vegan walnut maple cereal bars. 1. As a diehard toast lover—I’ve gone through phases of eating dinner toast for weeks at a time, every night—I loved one writer’s sweet reflection on the popularity of toast in her family. 2. This New York Times article on “JOMO”—otherwise known as the joy of missing out—definitely resonates, and it gave me a good road map for using technology with more intention and better boundaries than the ones I set now. 3. A new project aims to give scientists a safe and uncontentious space in which to openly chronicle losses of confidence in their work. Replicability is considered to be an important part of the scientific process, yet many scientists don’t yet have a means of reporting failures in replication or handling self-correction; the Loss of Confidence project aims to provide a responsible and professional forum. 4. The push for a gender-neutral Siri is also an opportunity to examine gender bias in the AI world. 5. I was fascinated by National Geographic‘s evocative look at the science of sleep and the state of sleep in our contemporary world. I have been so floored by how often your weekend reading posts synchronize with my life so precisely. I’ve resonated with your words about loss and so many other things, and once again you have me in tears. My grandmother pasted away this week. You may have talked about your grandmother maybe once or twice on the blog before, but what are the odds that you would reminisce this week?! Thank you for sharing the precious tidbits of your life. This week especially it has served as another reminder that I’m not alone. I was recently listening to a podcast episode of Unladylike where they talk about the female gender and AI. They go much deeper than that article, also talking about gender bias that we teach to the AI. It is really interesting.